The painting "Madonna degli Innocenti" has been attributed to Jacopino del Conte, an Italian Mannerist painter, Andrea del Sarto’s pupil. 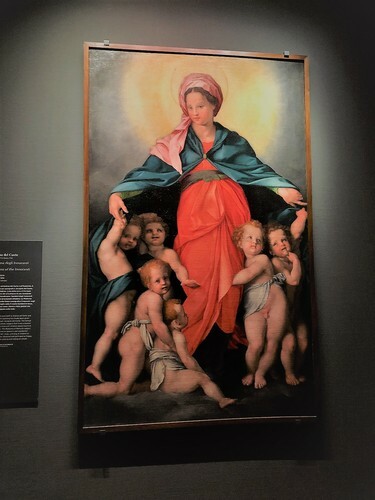 It is displayed in the Art Gallery of the Museo degli Innocenti in Florence.. The work of art was used like a banner under which foundlings of the hospital would walk in processions1. In the painting, the Madonna welcomes children in swaddling clothes under her mantle. They are idealized and are illustrated with playful movements, despite their not smiling faces indicating the suffering of their condition as orphans2. 1. From the explanatory plate near the painting in the museum. 2. From the audioguide rented in the museum.